As we continue to the "Tell Your Story" section, we'll look at what makes an event description both informative and impactful along with what types of information you should include. You're hosting a Bowl-a-Thon to offset the costs of providing emergency shelter, counseling, and advocacy services to Domestic Violence Survivors in your area. When writing your story, you want to make sure that the information you are providing about your organization is authentic, informative, and easy to understand. You can achieve this by centering your story content around the specific goals that your fundraising event will be working to achieve to help the groups your organization works to support. Support your story with data, by highlighting the specific impact your donors can have with their donations and fundraising efforts. This approach takes you from talking at a high-level to a more detailed, iconic story. When you are building out your story you will want to also be sure to include specific information about your event that participants will need to know to participate. For example, if your event has a specific start and end time, parking restrictions, items to pick up, or fundraising incentives you will want to include all of this information for your participants. 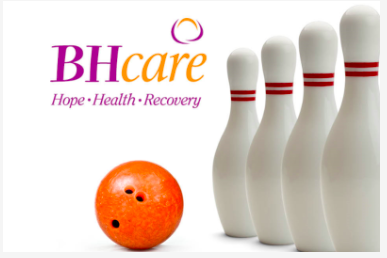 Join us for the 30th Annual Bowl-2-Benefit BHcare’s The Umbrella Center for Domestic Violence Services! One of the largest events of its kind in the state, the event unites over 1,500 concerned citizens, businesses, schools, organizations and community leaders in the fight against domestic violence. All proceeds benefit BHcare’s The Umbrella Center for Domestic Violence Services - providing emergency shelter, counseling, advocacy, and other support services for more than 6,000 adults and children each year. Teams of 4-5 bowlers of all ages and skills are welcome to participate. Teams must pre-register for one of 5 bowling sessions (9am, 11:30am, 2pm, 4:30pm, or 7pm). There is a $5 per bowler registration fee and all bowlers are asked to raise $50 in pledges. Participants receive 90 minutes of bowling, event t-shirt, shoe rental, soft drink and a chance to win some great prizes. The description for this event is concise and clear about fundraising objectives and expectations while highlighting the impact the event will have on the Domestic Violence Survivors this organization supports. All of the participants will receive the information that they need to participate and will receive knowledge about the positive impact their participation in the event will help to create. Your cover photo should be a large, horizontal image, at least 1500 pixels by 500 pixels, but no larger than 5 MB. The cover photo should illustrate your story and event. If your event has a specific image or logo that you would like to associate with it, that would be an ideal image to use as your cover photo. The best cover images avoid close-ups and anything with words on it. The mobile responsive design that GiveGab uses to ensure your campaign looks great on smartphones and tablets can cut off text and make close ups even closer! The story image will be the image that is shared on social media, so this image should illustrate your event just as your cover photo does. If your event or organization has a specific logo you want shared on social media along with the event, this would be the best place to use this image. If you have further questions about this, check out these helpful blog article on how to record and upload your video in 30 Minutes or Less! There are six templates to choose from You can see the different templates here. Choose whichever you think is best! Ready to finish up your Fundraising Event styling? Click here to learn about creating a Custom Thank You to continue to engage with your supporters after they've made their donations.